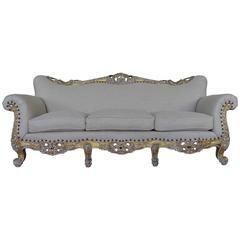 An antique 19th century Napoleon style boudoir sofa, perfect for a dressing room, retail space or foyer. 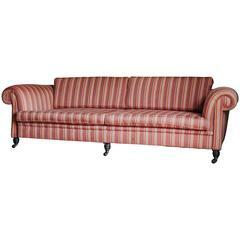 This piece has been completely rebuilt and upholstered in a vintage striped linen. The legs have been kept in their original condition and show age appropriate wear. 1950s Italian sofa completely refinished and reupholstered in a bouclé fabric by Knoll. Down-filled loose seat cushion. Oak legs in a black finish. Solid oak "Bonanza" sofa designed by Esko Pajamies for Asko. New webbing, original black leather cushions. Leather shows signs of age appropriate wear. 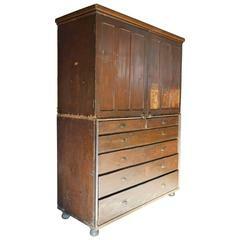 Oversized welsh train depot cabinet/armoire in two pieces (drawers base and cabinet upper). Even has original train schedule on interior inset of cabinet door! Antique French oak stools with plenty of patina. Four available, priced individually. 19th century French Regency sofa with down cushion. Sofa was upholstered 8 years ago. Stunning 19th century, French sofa and chairs. Measures: Sofa: H 90 cm W 120 cm D 54 cm. This is an English 19th century sofa, upholstered with Belgian linen. Original feet and brass work.